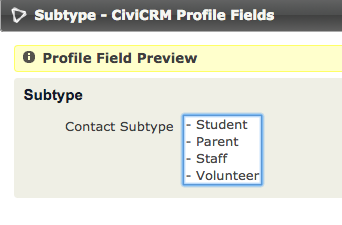 If you visit here on the CiviCRM Demo site http://d46.demo.civicrm.org/civicrm/admin/uf/group/field?reset=1&action=browse&gid=16 (What I did to create this was create a new profile, for the purpose of batch updating via profile, called Subtype and add the field "Contact" "Contact Subtype". ) Looking at the preview of this field the only options that are available are subtypes of Individual. Subtypes of Organisation do not show. How I can get the Contact Subtype field to display organisation subtypes? This looks like you've found a bug. You can submit a ticket to http://issues.Civicrm.org but it seems unlikely, given the frequency with which this affects folk, to get fixed by the core team without funding. I'm sure they'd accept a patch to address it though! Not the answer you're looking for? Browse other questions tagged profile contact-types or ask your own question. How do I include the contact image in a profile? 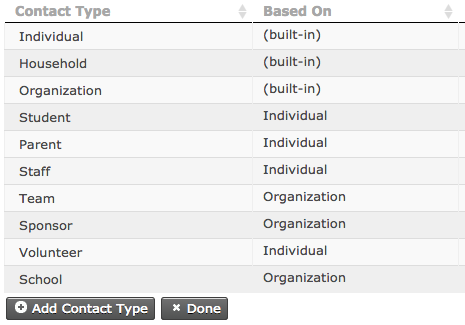 How to create a new contact type other than “Individual”, “Household”, or “Organization”?